Some of our best photographs were taken sitting down. Ok I'm just kidding. I actually don't recall any of my past postcards taken under such comfortable circumstances. But here we are, all tired and sleepy, just as the sun snuck-up from behind a row of trees. We left Manila at 10pm, drove to the Batangas pier and took the two and a half hour ferry ride across the channel to the island of Mindoro. From there we drove all throughout the night, down to the southern tip of the island, until sunrise found us on the outskirts of the town of Magsaysay. That explains why sitting down and chilling-out wasn't such a bad idea, specially when you realize I had to sit down too to catch the long shadows cast on the pavement! Enjoy. Where in the world is Magsaysay, Mindoro? 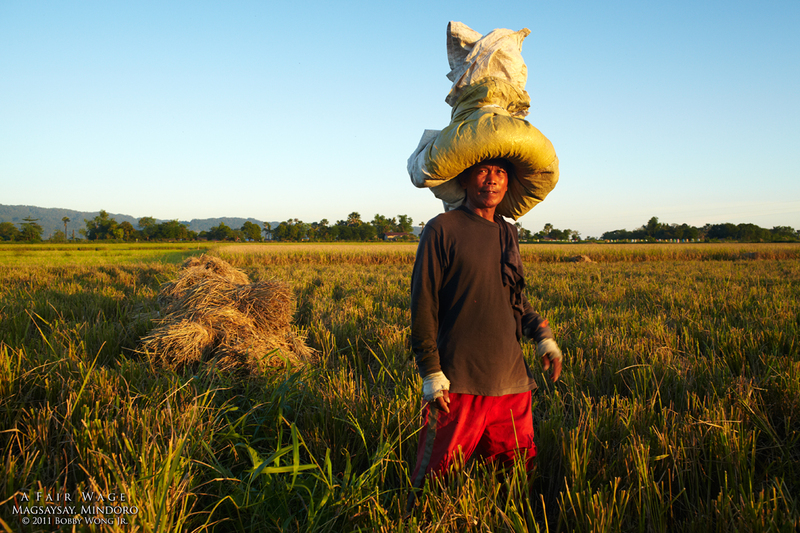 Now what would anyone be doing with a half-filled sack of rice on his head? Oh that's his wage, a fair wage, for a whole day's work. 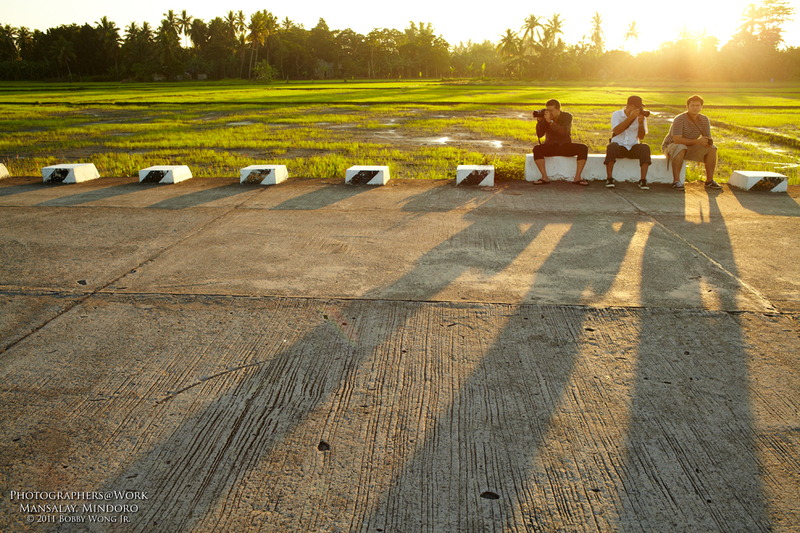 We were in the town of Magsaysay near the southern tip of Mindoro Island, waiting for the golden light of sunset. And by a grand stroke of luck, we had arrived at the peak of the rice harvest season, the last for the year. Around us, the mood was decidedly festive. The fields were dotted with folks at work. Some of them would make two hundred pesos a day. Others will get a portion of the harvest, just like this farmer above. Not too bad for an honest day's wage. Enjoy. Where in the world is Magsaysay, Mindoro?? Are they like steps on a staircase? Our trips to the Ifugao province usually take us through the town of Banaue. There we fetch our local guide and buy our supplies. Some of the best terrace views can be found right in town, just along the roadside in this bustling mountain community. Today’s postcard is proof. I have friends who haven’t seen rice terraces before. They think they're just like steps on a staircase. But as you can tell from the size of the farmer relative to the terraces in this week’s postcard, each step is at least 3 meters high. So yes they are like the steps on a staircase, except that here in Banaue they’re much much bigger. Enjoy. Where in the world is Banaue in Ifugao? Was it a leap of faith? 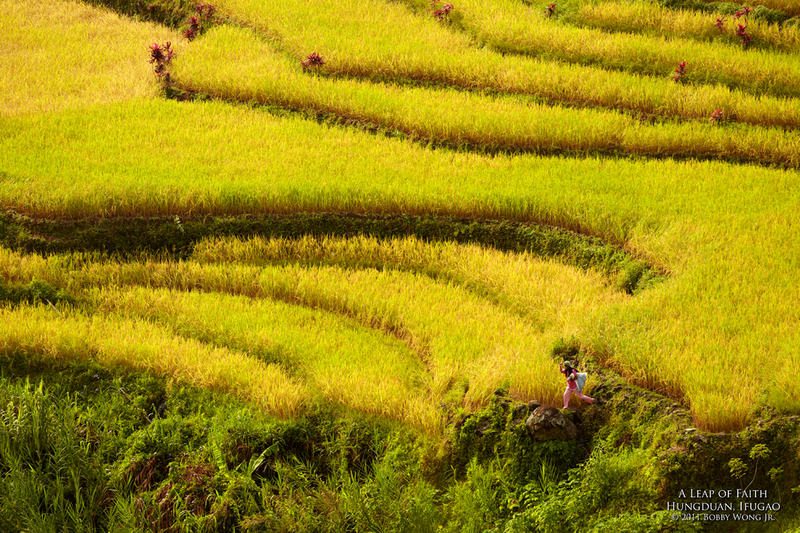 We were photographing harvest in the Hapao country-side, in Hungduan, Ifugao. 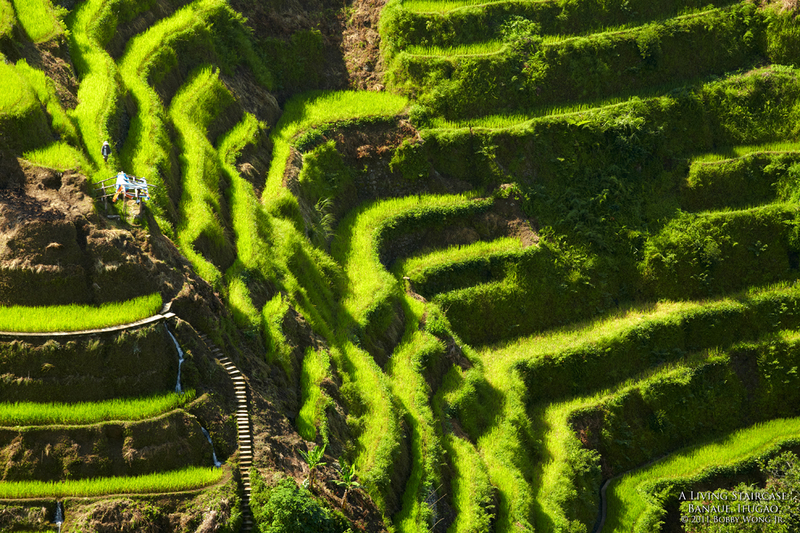 The land is mostly mountainous so rice is grown on terraces cut in concentric rings along their slopes. The fields are golden & awaiting harvest, but to get there, you have to balance yourself on narrow earthen dikes that eventually lead to the edge of a cliff, overlooking a ravine over a hundred feet deep. I had dreamt of following the farmers to the fields and photographing them while they harvested, but the terrain was too difficult. So I opted for the next best thing: shoot with a telephoto lens from a more comfortable vantage point. I saw this farmer jump over several gaps on the trail, right on the edge of the ravine, so I looked ahead to find the next gap, in an effort to catch her in mid-leap. A leap of faith. I eventually did. Enjoy.